Convention center "Nederlands Congres Centrum", built 1969 by J. J. P. Oud and H. E. Oud for the city of Den Haag. Great hall "Grote zaal" with 2000 seats, smaller hall "Theaterzaal" with 480 seats. 2005 renamed "World Forum Convention Center". 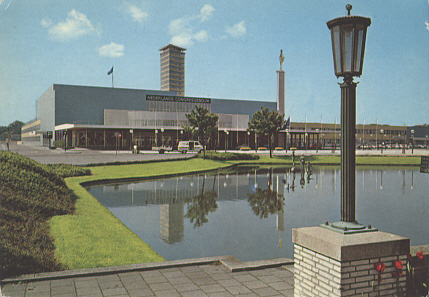 Front Text: inscription: "Nederlands Congresgebouw"
Reverse Text: "Den Haag/Holland, Congresgebouw"